Trees taken down in Jackson Park. by Mark Glennon: Plaintiffs in the federal lawsuit to stop construction of the Obama Center in Chicago’s Jackson Park yesterday filed a motion essentially alleging lawyers for the city and the Chicago Park District lied to the judge respecting work that has already started in the park. 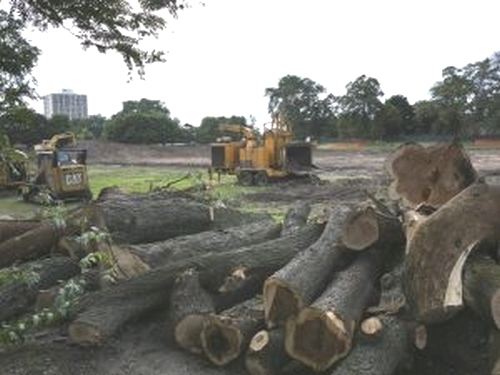 According to the motion, the city and park district earlier represented to the court that no work would commence on the Obama Center until a later hearing, but then proceeded with demolishing an existing track and field in park and destroying century old trees in order to build the center. The Chicago Sun-Times reported last month on that construction work. An architectural publication called that “Rahm’s Meigs Moment” — a reference to Mayor Richard M. Daley’s pre-dawn, surprise raid to tear down Meigs Field in 2003. The court last month allowed that work to proceed and set a schedule for the case based, according to the new motion, on representations that the track and field work was unrelated to the Obama Center. Those representations were false, according to the new motion. As evidence, it cites a Donation Agreement between the park district and the Obama Foundation (which is building the center) that ties the work at issue to the center. A hearing on the new motion is scheduled for Thursday, September 20. The lawsuit was brought by Protect Our Parks, Inc. and certain individuals against the city and park district. Case No. 18-cv-03424 in the Northern District of Illinois. These new allegations of dishonesty appear entirely sound to me and are yet another chapter in the Obama Center fiasco. We’ve written earlier about how the center has been dishonestly rammed through — illegally for the reasons laid out in the original complaint. Initially pitched as a presidential library to be constructed entirely with private donations, it’s in fact a political operation, not a presidential library, and is heavily subsidized by taxpayer dollars and free parkland. Our article about how federal as well as Illinois taxpayers are footing the bill was featured in the Wall Street Journal. I last visited the site a couple weeks ago and the work going on is very substantial. Interestingly, it’s hidden by tall construction curtains that block off most viewing. Our earlier articles on the center are linked here. Mark Glennon is founder and executive editor of Wirepoints. H/T Truth in Accounting for identifying article. Tags: Rahm’s Meigs Moment, Chicago, lied to court, about, on going wotk, Obama Center To share or post to your site, click on "Post Link". Please mention / link to the ARRA News Service and "Like" Facebook Page - Thanks!